As the U.S. Army moves from a deployed force to a deployable force, the Army needs smaller and lighter combat vehicles offering increased lethality, survivability, and mobility. These requirements are further combined with the need to assimilate and distribute more information to, from, and within the vehicle. To achieve these goals, the Army's future combat vehicles will need highly integrated multi-mission capable crew stations. The Army's move toward a digital battlefield has also created a tremendous need for revolutionary increases in vehicle and command, control, communications and computers (intelligence) (C4I) systems performance. 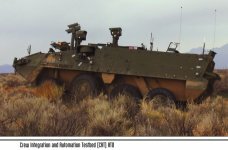 TACOM is actively pursuing the application of UGV technologies to manned systems in the Crew integration and Automation Testbed (CAT) ATD. The purpose of the CAT ATD is to demonstrate the crew interfaces, automation, and integration technologies required to operate and support future combat vehicles. The key goal is to develop a multi-mission capable crew station for the FCS program that covers 100 percent of the fight, scout, and carrier crew tasks currently performed with three unique systems, as well as embedding the control of both UAVs and UGVs. A driving requirement is that the system be operable with a crew of two over a full suite of FCS missions and be compatible with a C-130 transportable vehicle. The goal of the Crew-integration and Automation Test bed (CAT) Advanced Technology Demonstration (ATD) is to demonstrate a multi-mission capable two-man crew station platform concept, which will be integrated into a C-130 transportable chassis supporting the Army's objective force. 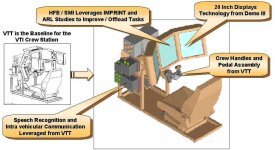 This program focuses on an improved soldier machine interface (SMI) design using indirect vision driving and automated decision aids, an advanced electronic architecture design/network topology, and embedded simulation. By demonstrating these advanced technologies and added capabilities, the CAT ATD will prove out technology readiness to sufficiently transition and integrate hardware and software components into the Future Combat Systems (FCS) demonstrator. Design an advanced 2-man crew station for a system < 20 tons incorporating the FCS fight, carrier, reconnaissance, and C2 of unmanned systems. Prove out technology developments using a FCS class chassis to test against our exit criteria. Technologies to be investigated include both traditional Soldier-Machine Interface (SMI) technologies (e.g., helmet-mounted displays, head trackers, panoramic displays, speech recognition, 3-D audio, etc.) and robotics technologies (e.g., intelligent driving decision aids, semi-autonomous driving, automated route planning, etc.). Workload analysis performed under the CAT program indicates that the driving aids and automation technologies are key to achieving two-person operation of future systems. The crew stations and technologies will be integrated into an IAV and demonstrated over fight, scout and carrier mission scenarios in FY03 and in FY04.